The American Association of State Highway and Transportation Officials Committee on Maintenance will hold its annual meeting July 21 to 26 in Charlotte, North Carolina. The Winter Maintenance Policy Coordination Committee, which serves as the steering committee for the Snow and Ice Pooled Fund Cooperative Program (SICOP), will also meet at this event. Details. This recently published book addresses a wide range of winter maintenance issues and includes contributions from several Clear Roads investigators. The book provides a comprehensive overview of best practices in sustainable winter road operations currently in use around the world. Topics include materials, processes, equipment, weather services, safety, mobility, strategic planning and performance measures. Book description. Prewetting is a common practice to increase the ice-melting effects of road salt. This article discusses the importance of adding liquids to road salt and provides suggestions on how to increase the effectiveness and efficiency of the process. Article. 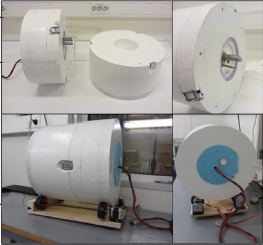 Researchers in Norway used a custom-made calorimeter to study the effect of additives on the low temperature ice-melting capacity of sodium chloride (NaCl). Magnesium chloride, calcium chloride, potassium formate, calcium magnesium acetate, and sugar were added to NaCl at −18°C. The chemicals were also tested individually. Paper. In this study, researchers in China investigated the deicing and anti-icing performance of polyurethane concrete pavement surface layers. 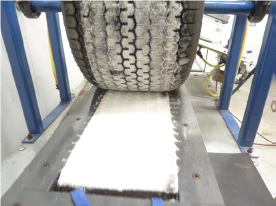 Laboratory test results showed that polyurethane concrete has greater specific heat than asphalt concrete and can significantly retard ice formation. Abstract. Frost heave can cause severe joint deterioration in concrete pavements. 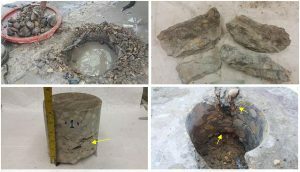 Researchers investigated the frost actions of deteriorated pavements, used temperature sensors embedded in pavements to determine local freeze-thaw conditions, and evaluated the frost-heave and thaw-weakening susceptibility of three pavement foundation materials. Abstract. This research investigated the performance of potassium succinate (KSu) as an alternative deicing agent to sodium chloride (NaCl). Laboratory tests showed that KSu functions as a deicing agent only at -5°C (23°F) or higher, and has a slightly lower ice-melting rate and similar friction performance compared with NaCl. Report. Researchers conducted laboratory tests to determine the level of chloride left behind from salt brine used on asphalt and concrete pavements after snowplowing. Less chloride was found on asphalt pavement than on concrete, and more chloride was present on both types of pavements in warmer temperatures. Report. 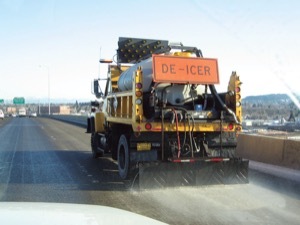 Deicing salt solutions applied to roads can contribute to premature deterioration in areas adjacent to joints in concrete pavements, although the root causes are not fully understood. Researchers in Canada found that deterioration on regional roads was caused by a combination of physical and chemical factors due to interactions between salts, freeze-thaw cycles, and the pavement. Abstract. The Accumulated Winter Season Severity Index (AWSSI) is a straightforward, publicly available tool developed by the University of Illinois using non-proprietary national data that is available from the National Oceanic and Atmospheric Administration. Researchers will enhance and modify the tool to allow for historical and current winter data comparison and provide better correlation of winter severity index to winter maintenance costs. Project description. This research aims to reduce blowing and drifting snow problems by working with and understanding landowners’ knowledge, attitudes and practices on the issue. 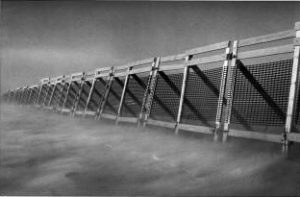 Researchers will design an outreach plan to promote greater adoption of snow fences to improve public safety and increase cost savings. Project description. This research will explore how in-use vehicle data can be used to help reduce snowplow vehicle fuel consumption and lower operating costs. Project description.